A total of 11 product in a set. I am really interested with the Essence STAYS no matter what 24h waterproof eyeliner pen & the Essence I love extreme crazy volume mascara cause I can have a more bigger & attractive eyelid & eyelashes. There are 11 products that you're giving away. I always wanted to try the eyebrow powder, heard a lot of great things about it! Thank you soooo much for this giveaway! There are 11 products in the giveaway set! :) I'd love to try Essence lipsticks because I've read many good reviews about them, and they're so affordable. There are 11 products in the giveaway set! There are total 11 products in the set of giveaway. My favourite product is essence all-in-one bb cream because it is free of oil and perfume, provides intensive moisture and covers impurities without blocking the pores. So i feel very safe to use it. There are total of 11 products in this giveaway set. I would like to try out the crazy volume mascara for more voluminous and natural black eyelashes. Besides that I've read many good comment about this so I wish to get a chance to try them out. There are total of 11 products in Essence Makeup Set Giveaway. 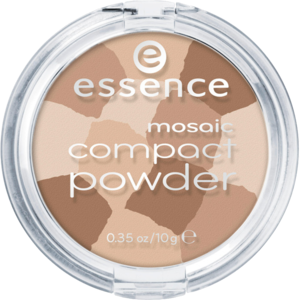 I am very much interested in Essence Mosaic Compact Powder because when I look at the giveaway post, the compact powder seems to be different, not like an ordinary compact powder. The mosaic texture with different colors are very attractive. I wonder how it looks when applied on my face. Just curious about it and would love to try it. There are total 11 products in the set of giveaway. 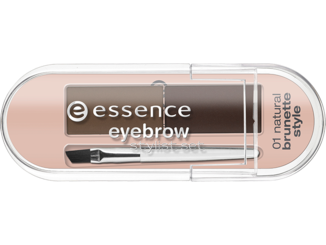 I would like to give myself a try on the essence eyebrow stylist set because I want to draw a pair of Korean Style eyebrow! I never have the courage to draw a pair of Korean eyebrow because I'm not good at drawing them. So if I'm the lucky one to get this set, I would definitely want to try this! Hi Chency! There are a total of 11 products to be given away in the set. My favourite would be the essence STAYS no matter what 24h waterproof eyeliner pen because I am an eyeliner junkie and it's difficult to find a good eyeliner in the market these days. They either smudge, or have bad colour payoff. So I hope this Essence one can meet my expectation and STAY NO MATTER WHAT! There are total 11 products in the set of giveaway. My favourite would be ssence STAYS no matter what 24h waterproof eyeliner pen as no matter what the line will not smudge. This will sit me as I dont have to worry my eyeliner got smudge after sweaty dancing in the clubs! T_T No girl will look pretty in smudgy eyeliner! Hi Chency! There are a total of 11 products to be given away in the set. My favourite one is Essence all-in-one BB cream because it ensures a smooth, radiant and flawless complexion. It makes small skin imperfections disappear without blocking pores. It's also oil and perfume-free with spf 30 which is attracting me the most because I like those products with oil-free & perfume-free. Thank you! There are total 11 products in the set of giveaway. My favourite product would be the "essence i love extreme crazy volume mascara" because I have short lashes and I need it to volumize my lashes! There are a total of 11 products in this give-away. The product that I caught my interest is "essence all about matt! 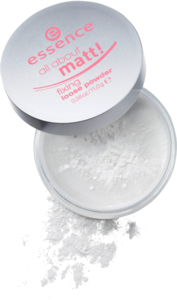 fixing loose powder" because I have oily skin and I need a good powder that will keep my skin matte for as long as possible. 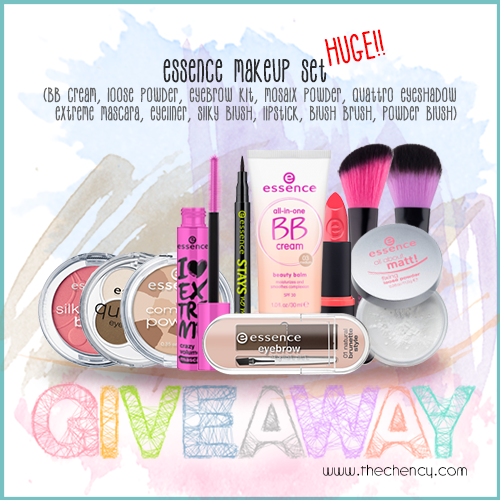 There are total 11 products in the Essence Make up set of giveaway. Total 11 items giveaway. I would like to have essence STAYS no matter what 24h waterproof eyeliner pen as eyeliner is like a soulmate for my eyes. Without eyeliner. I will looks like not enough sleep. There are total 11 products in the set of giveaway. My favourite is essence blush brush. Blush is an amaze things to brighten up the skin . plus he color of this brush is just too trendy and catch my 1st sight! 11 products in the set of giveaway. I would love to have the essence all-in-one bb cream, as I'm a big fan of BB Cream as they give me a smooth & flawless complexion & cover up my big pores and uneven skin tone. Plus, I can get ready & make-up in a jiffy. There are 11 products in this giveaway. My favourite is essence quattro eyeshadow, because it colour my eyes and make them speak! There are 11 products in total for this giveaway. The one thing that I really like to try is the Essence Eyebrow Stylist Set. I am a huge fan of eyebrows kit and I've always wanted to try the brows kit from Essence! I would like to have the eyebrow kit. Because i want to have tidy and beautiful eyebrow to look more prettier. With this eyebrow it will be easier for me to do it by myself. There are 11 products in total for this giveaway set. I dunno which is my most interested because i had never done my own make up before in my entire life. I would like to give a try to make up on myself. And if i need to choose which was my interested i would like to choose the essence long lasting lipstick because i always had a pale lips. There are total 11 products in the set of giveaway. I want to try essence all-in-one bb cream for smooth, radiant and flawless make-up which i always looking for. For this fabuloues giveaway set there is a total of 11 products! Just a beginner makeup user and would totally love to win this giveaway so that I can get familiar with using makeup. The essence-all-in-one bb cream would be the best product to win to get the flawless skin I always wanted easily! Thanks for the giveaway! There are a total of 11 products in the giveaway set. 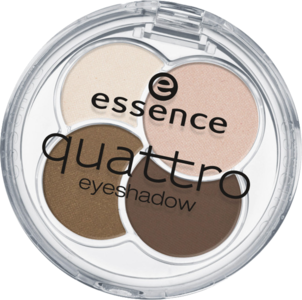 The product that I wish to try is the essence quattro eyeshadow in 05 To Die For.I have always love neutral,smooth,long lasting eyeshadow that are easy to blend with, and eyeshadow that are highly pigmented without being too glittery. Essence quattro eyeshadow seems like a good match for these criteria. There is total 11 products in Essence Makeup Set that Chency giving away. I would more interested in essence STAYS no matter what 24h waterproof eyeliner pen because I always apply eyeliner when going out but it always will never last & get good after a whole day out. Therefore, I would like to try on it & have beautiful eyes for a long whole day! Thanks Chency hosting this giveaway! There are total 11 products in the set of giveaway. My favourite product would be the "essence i love extreme crazy volume mascara" because no matter where I go, even if I'm wearing no other makeup, mascara is my neccesity!! The giveaway set has a total of 11 beauty products. I am very interested with the 'essence STAYS no matter what 24h waterproof eyeliner pen' because I cannot live without eyeliner. I always need a few slick of eyeliner before I go out. Eyeliner is a must for me! There is total 11 products in Essence Makeup Set that Chency giving away. My favourite product would be 'ESSENCE EYEBROW STYLIST SET'. -> It's perfect match for my eyebrow colour and really looks very natural. -> I only use the darker colour so i sometimes use the lighter one as a crease-definer. -> For me, this works great, just a little filling in, nothing much and it's going a lot faster and easier to draw my eyebrows perfectly. -> Its small size to carry in my purse cosmetic bag. It has been a great product for great value, great colors, goes on smooth and stays all day. Thanks Chency for this giveaway! Thanks Chency for this AWESOME giveaway! It's very subtle shimmers which provide a nice sheen and prevent the shade from looking dull. 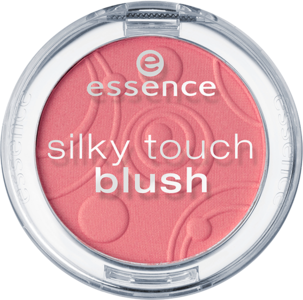 I wouldn’t call the texture silky, but it is very soft to the touch nonetheless and it blends effortlessly into the skin. Blends easily and long lasting. I've used it since morning till evening and the color still stay on my face. I really love the warm glow peach blushes give to my pale skin. I have this in Adorable and Life's a Cherry and they are awesome blushes! Very great quality for very low price, what more could you ask for? I prefer this pink shade, it's look sweet and cutie. This is the best color payoff. It smells nice and stays on well. Lightweight and moisturizing to lips.